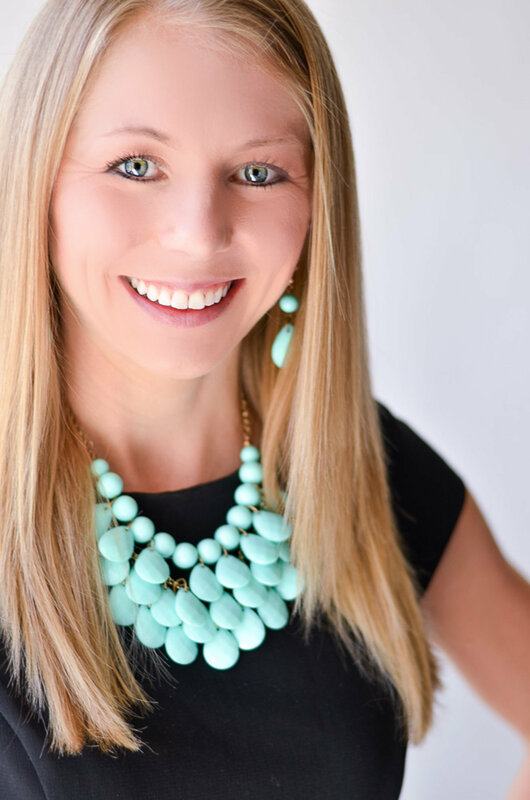 Eeek … I had big plans to make you a Valentine’s Day recipe for today’s Foodie Friday, since Valentine’s Day is just one week away. It was going to be a healthier version of my very favorite Valentine’s Day treat … chocolate covered strawberries. Then … it was “feels like” 6 degrees and snowing in Dallas yesterday, and while that’s not cold enough to prevent me from running outside, that is cold enough to prevent me from going to the grocery store! So here’s the compromise. I’ll tell you the recipe, which sounds wonderful in my head but has never been tried out, and you’ll pretend there are beautiful pictures and a satisfaction guarantee along with it. Then, if you play along with my little strawberry game, I’ll give you a real recipe … one that I have actually tested out! It happens to be incredibly easy, tasty, and super healthy, so I think you’ll forgive me! Now for those (imaginary) chocolate covered strawberries. In my head, you’d mix a single-serving container of plain Greek yogurt with a tablespoon or two of unsweetened cocoa powder, then add in several drops of liquid stevia. You’d stir the mixture, dip your strawberries in until they’re liberally coated, and place in the freezer until they harden just a bit but aren’t rock solid. Doesn’t that sound delicious? I hope you try it for me, while I stay cozy and warm at home eating my cauliflower fried “rice”! 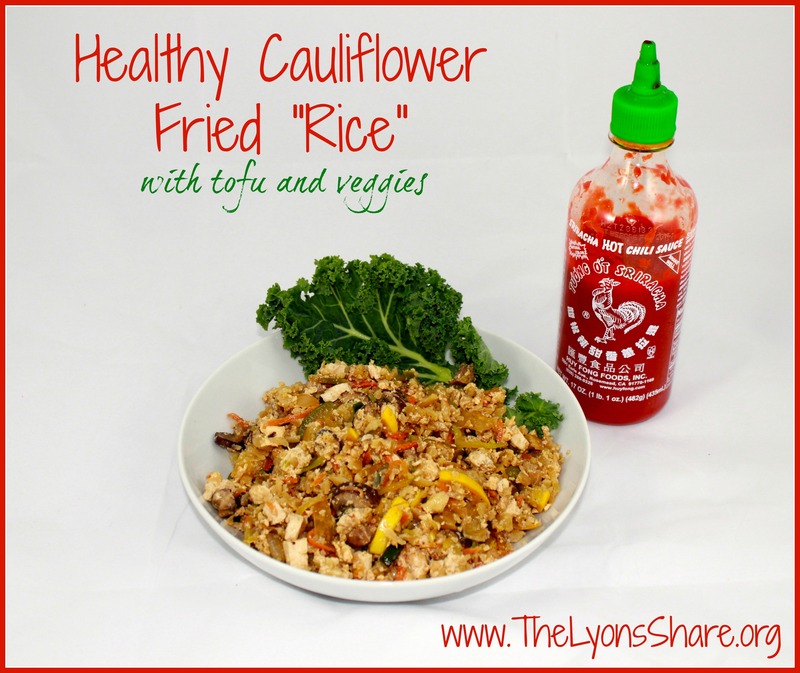 And yes … if you have a very good memory, you’ll remember that I’ve already published a version of cauliflower fried “rice” on the blog. This one is quite similar, although the flavor profiles are a bit different, the mixture of vegetables has changed, and the latest version is vegetarian while the old one had chicken. If you try them both, let me know which you prefer, because I’m torn! They’re both chock-full of nutrients, fiber, and protein. Plus, you can eat a satisfyingly large serving without an ounce of guilt! Let’s get started! In a large skillet, heat olive oil over medium heat. Add onion and sauté until beginning to soften. Add chopped mushrooms, zucchini, carrots, and broccoli slaw, and sauté another 7-8 minutes. Add riced cauliflower to pan and stir. After pressing/ draining your tofu, dice into small cubes. Add tofu, ginger, salt, and pepper to pan, and stir. Chop up the tofu with your spatula until it looks crumbly, like scrambled eggs, and mixes in with the cauliflower. Pour in rice vinegar, soy sauce, and eggs or egg substitute, and cook, stirring periodically, until set. Place into two large bowls, top with sriracha as desired, and enjoy! Each serving will contain 6g fat, 17g carbs, 16g protein. So tell me in the comments … Do you ever create recipes in your head but never end up trying them? What’s your favorite Valentine’s Day treat? Have you gotten onboard the cauliflower fried rice train yet? ← Losing Weight While Marathon Training: Impossible? Michael Anderson recently posted…Thought for Thursday – Can You Separate Artist and Art? Yummy! You cracked me up with a grocery store story! I hope you like it Olena! Yummy! I love that you did a take two on this — I am thinking of doing that with some recipes because I feel like I made them “better” since initially posting them. I’m alwaysss creating recipes in my head but I try to write them down and keep lists of things to try. Happy Friday friend, hoping things are well! I do the same thing with lists of recipes, but I just thought the strawberries were so perfect for valentines day that if I had posted them the week after people would have thought I was crazy :). I was googling things like “pool of grease omelet restaurant” because I was trying to show how sometimes you can get way more grease than you bargained for. Obviously your pics weren’t greasy but maybe you talked about it in a post or something! Oh this looks so delicious! What a great healthy substitution! That looks so good!!!! I don’t think Phil would go for it–he always figures out my cauliflower trick! It’s so hard to trick those guys :). Kevin actually did enjoy the cauliflower rice and would definitely eat it again- it’s the tofu he didn’t like, so the first version of my recipe was better for him! Hope you enjoy the cauliflower fried rice Kammie! Yikes! Thank you!! Fixed!! Hope you didn’t end up with a blender full of raw cauliflower to munch on. Enjoy the recipe – toss in some extra olive oil or sesame oil and bulk up the tofu to support your growing muscles – this recipe is pretty light (but filling!) as it is. I LOVE this! Better than strawberries. 😉 Great pics, too! My attempts at cauliflower rice have not even come close to as good as yours sounds. Yum! This one really is good, and super easy too! 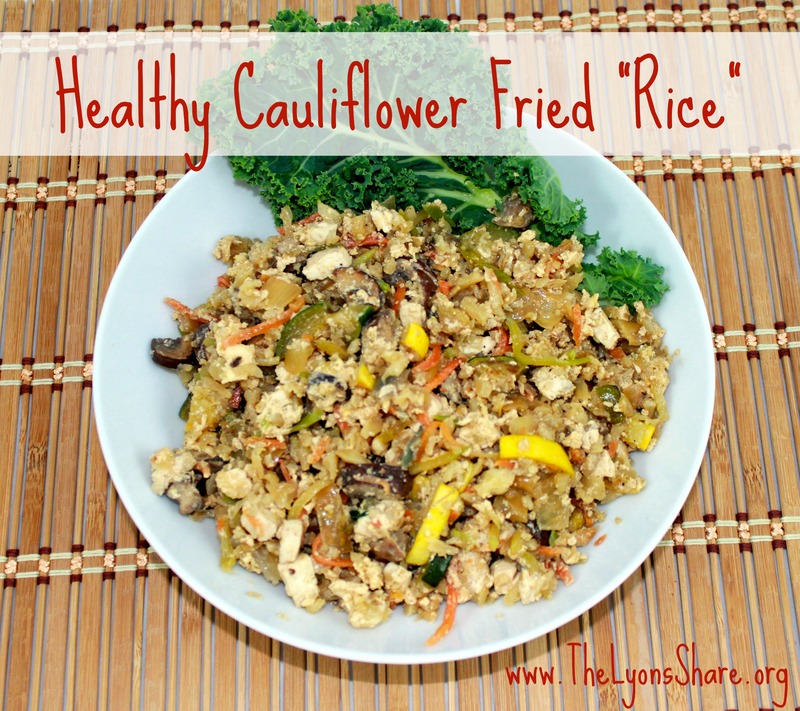 I hope you give cauliflower rice another shot!